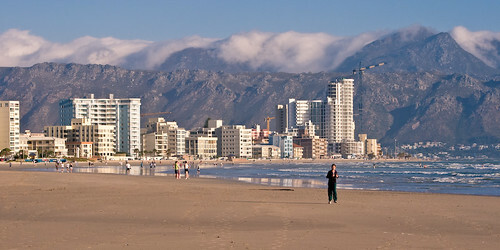 When we moved from Gauteng to the Western Cape at the end of 1999, we chose to live in Strand; mainly for the small-town atmosphere and the lovely beach front. The small-town atmosphere is still largely there, despite the huge amount of development going on in the area around Somerset Mall. The beach front though, has changed dramatically; for the worse, most locals would feel. Gone are the small hotels and holiday apartment blocks that accommodated scores of holiday makers in the December summer holidays; they have mostly made way for flashy new high-rise residential apartment blocks, with more being built all the time. There are still a few houses and small blocks, but as the signs in this photo show; their days are numbered. The new blocks going up are expensive, with apartments being advertised with come-ons like “From only R2,500,000”. Perhaps I’m naive but I fail to see how the word only can be used with a figure like that. I wonder who the residents of these new blocks are and how they feel about the state of the area their shiny towers are in? Beach Road and the beach front facilities, once the big tourist draw cards, are in disrepair. The historic jetty has been unusable for years but rather than being repaired or simply demolished, it has been fenced of in the most unsightly manner possible. 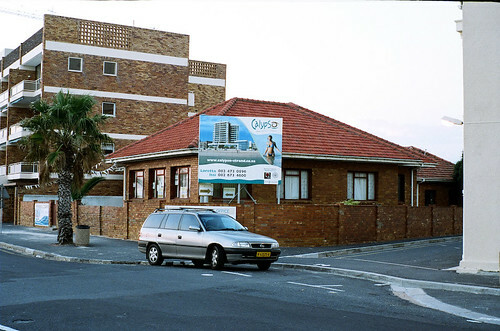 This entry was posted in Photos, Thoughts and tagged apartment, Beach, Cape Town, change, jetty, progress, South Africa, Strand, Western Cape. Bookmark the permalink.